Don't let this supine canine lie. Engaging story; Ample missions; Side-quests are fun to play. Framing issues in the PC version. They say nobody does open-world games like Rockstar. With titles like the GTA series and Red Dead Redemption on its resumé, you'd probably nod your head in affirmation. 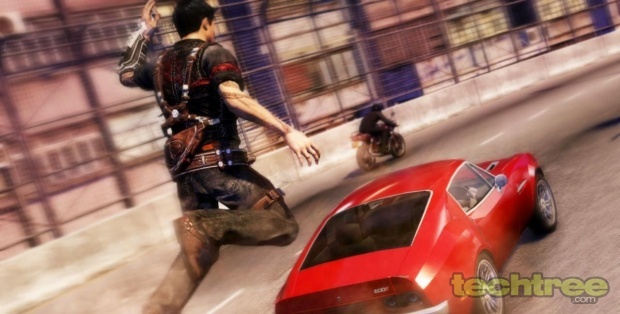 However, there's a new kind in town when it comes to the sandbox genre: Sleeping Dogs by Square Enix. Before I get down to the details of the game, let's just get one thing out of the way. This game is absolutely magnificent. Even with the few shortcomings it has, it still manages to be outright fun, and that's quite an achievement. There's nothing scarier than your friend's mom holding a meat cleaver to your face. Click to enlarge. 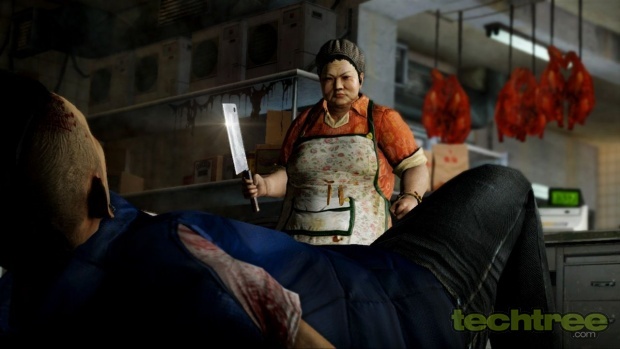 Sleeping Dogs offers an over-the-shoulder look into Wei Shen's life, who shown participating in a drug deal during the opening sequence. The party gets crashed by the cops, and an on-foot chase sequence ensues, which cleverly serves to familiarize you with the basic controls, while also introducing you to the seedy alleys, backroads, and kitchens of the dark underbelly of Hong Kong. Eventually, you get arrested and taken in for questioning, whereupon you realise that Wei is actually a cop working deep undercover. This double life sets you up nicely for what lies ahead. As a clandestine officer of the law, you get to undertake missions for both the Hong Kong Police (busting drug deals, cracking down on the underground racing circuit, and so on), as well as the Sun On Yee Triad, a gang you're supposed to infiltrate. Every mission you complete gives you experience points across three variables: Police, Triad, and Face. Upgrades in your Triad and Police sections unlock special combat moves, whereas the Face meter provides access to better clothes and fancier cars — after all, that's the way a gangsta moves up in the world. Performing petty favours, such as helping a vendor out by beating up thugs to get his money back, gets you street cred in the form of Face points. This is a really cool concept, as it keeps you interested in the various small side-quests — missions I usually tend to avoid in other games. This is what Dhoom 3 would look like if it was set in Hong Kong. Click to enlarge. 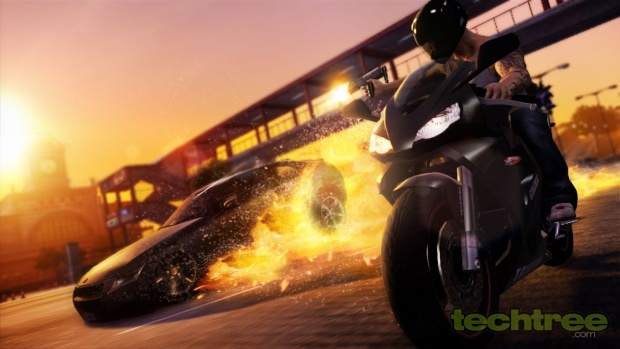 The game takes a little while to throw you into the open world goodness of the city. You have to go through a bunch of very linear missions before the true exploring begins. However, once you're past that phase, Sleeping Dogs hits you square in the face with its awesomeness. The gameplay mechanics are very straightforward and easy to master. I recommended you play this title with a gamepad even on the PC, because the combat, driving, and minigames are much easier to handle with a controller. The latter is among the best parts of the game, offering a huge variety in the tasks you have to perform — tracing a cellphone, picking locks, hacking cameras, and even singing karaoke. While the story is quite easily the title's strongest aspect, a few flaws also rear their ugly heads. For one, the graphics aren't exactly out of this world. I've seen far better-looking games, and in this day and age, I expect a little better. Moreover, the dialogues are a little weak, with many lines sounding just plain amateurish. However, the most disappointing glitch is that the game has a fair amount of framing issues. Expect the action to stutter when driving fast on a freeway, as it did with me, even though I have a Palit GeForce GTX 550 Ti. Fortunately, it's very easy to overlook these slip-ups, if only because beating up thugs and getting through the story is so much fun. Damn, this isn't a BEST bus?! Click to enlarge. Two Thumbs, And Two Big Toes Up! Sleeping Dogs is one of the most engaging games I've played this year. The story is well laid out, and questions about which side of the fence Wei Shen would end up on kept me glued to my seat, with no regard for nourishment or even the concept of an outside world. There are about 30 hours of gameplay packed into the the main storyline, not to mention the impressive variety of side-quests — none of which you'll want to miss out on. I give Sleeping Dogs 4 stars on 5, because unlike its title, it's guaranteed to keep you from hitting the sack for a few nights. Besides, you have to hand it to a game if it manages to divert your attention successfully from Football Manager 2012. Yep, my copy of FM2012, which is lying in a forgotten corner of my hard disk, tips its hat to Sleeping Dogs. Check out the image gallery below for a bunch of more screenshots. Played On: Intel Core i5 3.0 GHz, Palit GeForce GTX 550 Ti, 8 GB RAM, ASUS Xonar Essence STX sound card. Minimum Requirements: Intel Core2Duo 2.4 GHz \ AMD Athlon64 X2 2.7 GHz, 2 GB RAM, NVIDIA GeForce 8800 GT \ AMD Radeon HD 3870 with 512 MB RAM, 15 GB HDD space, Windows Vista, DirectX 11.0. Recommended System: Quad-Core Intel or AMD CPU, 4 GB RAM, NVIDIA GeForce GTX 560 \ AMD Radeon HD 6950 with 1 GB RAM.